As I’m certain is true for most of the U.S., we like pizza in this house and in fact, have pizza at least once a week at the old Smith Bites Homestead. And while we adore a sourdough or yeasted gluten-free crust, there are times when I don’t have dough ready to go when the mood strikes. A few months back, I happened to catch a Facebook status about bar-style pizza – pizza made using flour tortillas and using a seasoned cast-iron skillet; it seemed too good to be true – because we’d tried, and failed, to successfully use a tortilla as a pizza base. 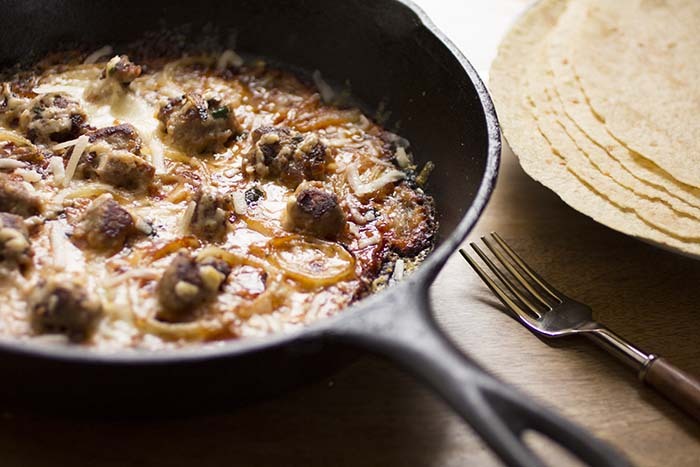 Turns out, the method of using a cast-iron skillet guarantees success – as well as using a good flour tortilla base. We’ve written about Toufayan Gluten-Free Wraps before and we wondered if a wrap might work for our pizza; I’m happy to report it works perfectly!! The trick, as I said, is using a hot cast-iron skillet as well as keeping your toppings simple and using a light hand when applying. Toufayan Gluten-Free Wraps are the only wraps we use; they are soft, bendable and taste like a real flour wrap; they’re made without any trans fats and have been family-owned for 90 years. 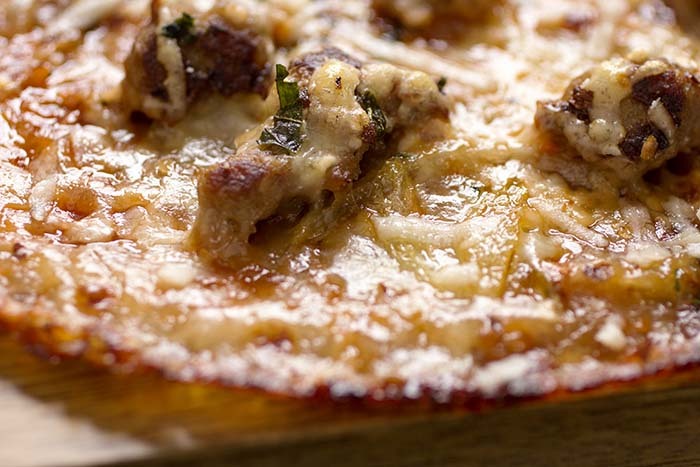 This recipe is a cheater’s version of a Midwest pizza I wasn’t aware existed until I moved here about 18 years ago; at first, I couldn’t imagine eating a BBQ Pork pizza . . . but turns out, it’s now one of my favorites. Does this officially make me a Hoosier? Make the pizza. Ready in 12-minutes, it’s a game-changer, I promise. This is FANTASTIC. Good Lord would ya look at that. Now I’m all weak. I saw the same recipe and thought, “Huh. I wonder if it’s any good?” Fast-forward a few weeks and we make it on a weekly basis. It’s my we-don’t-have-anything-to-eat-but-I-don’t-want-to-go-out meal. It reminds us of Hot Box. Last night Elena wanted me to teach her how to make it, which is a huge step for her in the kitchen. I’ll have to try your version!